Arsenal skipper Per Mertesacker has revealed that his priority is getting a new deal from his employers. He disclosed that his immediate dream is to remain in England with Arsenal. This comes amid speculation that the player might return to Germany. The 32-year old player is in the last year of his Arsenal deal but has not featured for the London-based outfit this summer since his injury this summer. With the additions in the squad, he would find it difficult getting a starting role again despite being the captain. “A new Arsenal contract has absolute priority for me. But no dates have been set [for talks]. Arsenal has the highest priority for me. Everything else is pure speculation, and I won’t join the discussion,” Mertesacker told Spox. Coach Pep Guardiola says he has phased out the idea of getting a defender this summer after seeing the performance of Aleksander Kolarov. 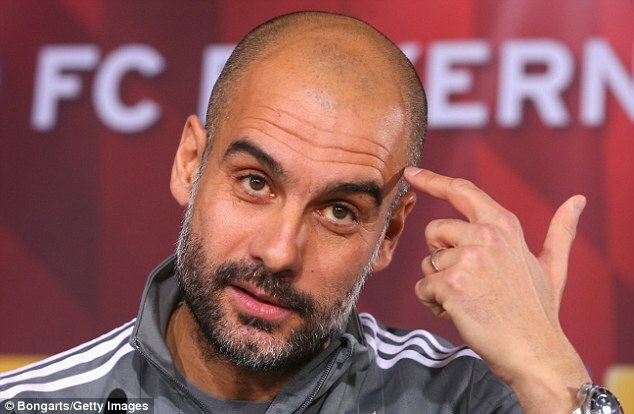 Guardiola is one of the favourites to lift the English Premier League title this season with Manchester City so it is expected that he leaves no stone unturned in a bid to reach his expectations. The former Barcelona and Bayern Munich manager admitted that he consulted with his assistants Rodolfo Borrell and Mikel Arteta before deciding to allow Kolarov in the role. “I’m delighted I spoke to Mikel and Rodolfo and said “do you think he is able to play in that position?” Guardiola said of Kolarov. “It is not easy to find a centre back with a left foot like him. We are convinced he has the quality to do that, to adjust,” he added. Kolarov did a decent job when City sealed their Champions League participation with the defeat of Steaua Bucharest. He has been decent in the Premier League games so far, so he is set to remain at the Etihad despite rumours that he would be among the first players to exit when Guardiola’s move broke out. The renowned former captain of Arsenal, Mikel Arteta has come to terms to join Manchester City in replacement of Pep Guardiola. Arteta left towards the end of last season due to expiry of the contract. He has decided to retire as a captain and take his career to the next level in coaching. The 34 year old was offered a role as a coach in the academy of Arsenal but he has agreed to join Guardiola with Manchester City. Guardiola and Arteta have been good friends since their learning days in Barcelona academy. Aaron Ramsey would be taking over the No.8 shirt of Mikel Arteta at the next season of Arsenal as per the announcement made by the club. Ramsey is said to switch from No 16 shirt that he wore in his previous matches and consider Arteta’s shirt as the Spaniard will leave the club to get into coaching this summer. Well, Ramsey is the 2nd player who would change shirt for the upcoming season and Alexis Sanchez will take over No.7 shirt of Tomas Rosicky. 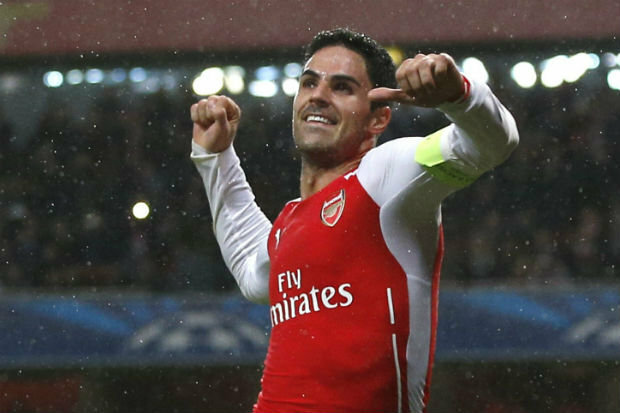 Arsenal player, Mikel Arteta is set to leave the club as the season ends. The player would join Tomas Rosicky and Mathieu Flamini. Arsene Wenger, head coach of the club said Arsenal “will lose three big personalities” when the players exit the club this summer. Wenger paid tribute to the trio of midfielders at his news conference on Friday as all three are out of contract after the season ends following Sunday’s home game against Aston Villa. Only Flamini has been a regular player this season, with Rosicky making only one appearance because of injury troubles. 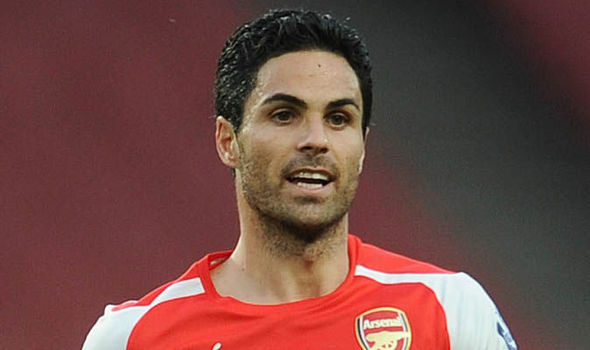 Arteta, the club captain, has also struggled with injuries and was often left out of the squad even when fit. “Arteta has been a great leader. All these players will have to decide if they go on with their career as a football player or as a coach. Arsenal FC Manager, Arsene Wenger has expressed his disappointment in Theo Walcott. The Frenchman says the forward is not living up to expectations at the club. He says he still believes the Englishman will prove himself. Wenger has been under pressure to sell the player this summer and look for more prolific attacking option upfront. Arsenal are in third place in the English premier League. They have lost out in other competitions this season. Barcelona knocked them out in the UEFA Champions League recently. They are out of the FA cup and Manchester City has lifted the League cup already. The petite but pacy winger marks a decade since arriving at the London-based outfit. He joined from Southampton as a 16-year-old rising star. The Gunners star is the longest serving player in the team. In the attack, he has fallen behind Danny Welbeck, Olivier Giroud and quite recently, rising sensation Alex Iwobi. In the opening match of the season of the Serie A, there were a number of unexpected results which occurred. Juventus lost against Udinese, Ac.Milan was defeated after competing against Fiorentina, Napoli sustained a defeat after locking horns with Sassuolo and As.Roma could only muster a 1-1 draw with Hellas Verona. A lot of the big teams in Italy dropped unexpected points early in the season but Inter Milan managed to clinch a triumph as they overcame Atalanta with a final scoreboard of 1-0. Arsenal looked to have lost the presence of Mikel Arteta when the midfielder expressed his displeasure at being offered only a 12 month extension over the existing contract. Arteta even went far as questioning the judgement of manager Arsene Wenger by saying that the experienced players will offer a lot of more to the team than the Frenchman thinks. Such talks looked to have ended his Arsenal career, but he has agreed a new extension to his deal. This will see the 33-year-old stay for another 12 months at the least. Arsenal were also concerned about the fitness of the former Everton midfielder, but he has proven enough to earn himself a new contract. Arsenal have the opportunity to close the gap on the table leaders Chelsea when they take on Aston Villa at home on Sunday. Villa are so poor in the league this season that they are not expected to get much from the trip to the Emirates stadium. This will be the start of two consecutive tough matches for Paul Lambert’s team, as they take on table leaders Chelsea in the next league match in front of their own supporters. Momentum plays a crucial role in the league and Arsenal midfielder Mikel Arteta reckons that the gunners have much more of it right now. Arsenal suffered yet another home defeat at the hands of Manchester United after losing 2-1 at the Emirates stadium. This was despite the team from North London dominating for much of the 90 minutes. Mikel Arteta has reflected on his disappointing result by saying that Arsenal need to show much more consistency especially in the home matches. He says that scoring goals is what counts most in football and this has been proved once again. The defeat puts further pressure on manager Arsene Wenger, who has been able to survive long in the job merely on the fact that Arsenal have consistently qualified for the Champions League. The club’s Champions League qualification for next season is thrown into doubt once again as a result of this defeat. Arteta’s own future at Arsenal is under a cloud of doubt since he is thought to be angry with the fact that the club will not provide no more than 12 month contracts for players over 30. At 32 years of age, Arteta reckons that experienced players have a valuable role to play in the success of the club. Inability to reach a conclusion could see Arteta departing the Emirates in the summer. The Spaniard joined Arsenal in 2010 from Everton for £ 10 million. “We played our best game of the season, but it is about being ruthless for sure because when you are inside the box, and you cannot manage to score in that many situations, you cannot expect to win a football game.When you lose, there is something which is not going well, but we cannot forget (what we have done well) as that creates a lack of belief and confidence if you just take a lot of negatives at the end when you have lost the game,” said Arteta.